Albian paleogeography of greater Gulf of Mexico Basin, courtesy of GBDS. FULL PROGRAM AND ABSTRACTS have been released! Thirty years ago, the Gulf Coast Section of SEPM convened its 3rd Annual Research Conference on the Jurassic of the Gulf Rim (Ventress et al., 1984). 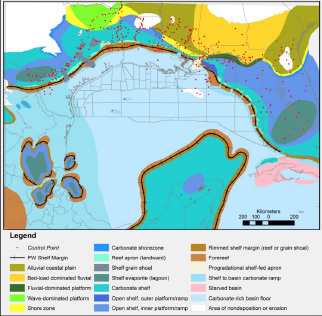 At this point, the Mesozoic being explored onshore as conventional carbonate and sandstone reservoirs, Cantarell Field (Mexico) was in its early stages of production, and offshore areas of the US Gulf of Mexico were primarily Cenozoic reservoir targets. Today, the Mesozoic is a habitat for large discovered volumes in unconventional shale reservoirs, Cantarell is in decline, and Mesozoic discoveries are being made in the ultra-deep water of the Desoto and Mississippi Canyons. Mexico has opened up for international exploration and development. Political events in Cuba may open up exploration areas. Scientific, technical, and political advances are underpinning progress in exploring and exploiting the Mesozoic of the Gulf Basin. New seismic refraction surveys are revealing the deep crustal structure of the basin and its early Mesozoic history. State of the art seismic reflection surveys are illuminating the subsalt domain of both the US and Mexico deepwater. New techniques like detrital zircon geochronology are reconstructing the continental scale drainage systems that fed the deep basin play fairways. New concepts about salt tectonics, depositional systems, source rock development, migration and charge are scientifically as well as economically important. Source rock plays like the Eagle Ford, Haynesville, and Tuscaloosa Marine Shale have changed our paradigms for resource evaluation. The 2016 Perkins-Rosen Conference will focus upon the Mesozoic of the Gulf Basin, from mountain source terrain to deep-water abyssal plain. A significant portion of the program will be devoted to the Mesozoic of Mexico and its potential for international exploration. A highlight will be a special SEPM sponsored research symposium on Mesozoic Source to Sink: Provenance and Process led by Mike Blum (U. Kansas). Our full program and abstracts booklet is available for download. As in the past, our registration fees will include an electronic copy of the conference, ice breaker, meals, and refreshments. We will try and maintain an accurate listing of papers and authors. As we did last year, we hope to have the final program (abstract book) online and available for downloading before the conference starts. 11611 West Little York Rd. Representative cores of the Mesozoic across the Gulf Basin, including presalt sections, Smackover, Tuscaloosa, Edwards, and other key intervals TBD. Coordinator: Laura Zahm (Statoil). $135. Participants in the core workshop will review a variety of significant facies, from microbalite buildups to platform margin reef, from alluvial plain to upper slope channels. Recognition criteria for each facies/surface and reservoir quality will be discussed. Representative log and seismic information will be shown.